The jury is still out on theories that King Arthur visited North America (more on that topic to come in future blogs), but I wonder whether Hal Foster knew of such stories; regardless, in this volume he brought Prince Valiant to North America, and he definitely knew of theories that the Vikings had made it to North America. Valiant doesn’t set out to discover America in this book, but rather it is an unexpected journey that begins with Aleta being kidnapped by Val’s fellow countrymen from Thule, which sends him and his men on a journey over the sea to an unknown land that turns out to be North America. The journey takes Valiant down the St. Lawrence Seaway and over Lake Ontario all the way to Niagara Falls. Of course, Val succeeds in rescuing his wife, but by that point, it is autumn so Val and his men decide to spend the winter in North America among the friendly Native Americans who have aided Val after he convinced them to help him because Aleta’s kidnappers were wreaking havoc on the land. This special Fantagraphics edition comes with an introduction that discusses Foster’s own journeys through the area depicted during a canoe trip in his youth with his pregnant wife, which inspired the story and Aleta’s pregnancy and the birth of Val’s son. This introduction is interesting for two reasons. First, it discusses how Foster sought to be respectful in depicting the Native Americans, not turning them into the typical enemies or sidekicks they were in other media at the time. While for the most part, this is true, he does make a reference to the Indians taking pleasure in cheating their customers when bartering. Worse, he builds on the myth of the Fair God, allowing the Natives to think Aleta is a goddess, and Val does prophesy his son will someday return to the land to lead the people to greatness, which supposedly became a legend that made it to the Aztec empire, causing them to think Cortez the fair god—a bit of a stretch in my opinion. (Later in the 1960 installments of the strip, Prince Arn does return to North America to teach the Natives white people’s ways, only to realize they already are doing fine on their own, which shows some progressive thinking on Foster’s part, though perhaps it was in line with Civil Rights thinking of the 1960s and not something he would have considered in the 1940s). The strip is more groundbreaking in the sense that a few years later, one of the native women marries one of Val’s men, and in 1953, the first interracial baby will be born in the strips. The other key event mentioned in the introduction, and perhaps the most significant part of this volume, is the birth of Valiant and Aleta’s son, Prince Arn. The introduction even includes photos of birth announcements sent out in Foster’s circle of friends regarding this event. Arn was actually the name Foster first proposed for the strip, but it was decided Valiant would be a better name. Still, he introduced a character named Arn into the strip, who possessed the Singing Sword and loved the same woman as Val. When that woman died, Arn and Val both agreed never to marry another. In friendship, Arn then gave Val the Singing Sword. After returning back to England and some other adventures, Val reunites with his old friend, Arn, wanting Arn to be the newborn Arn’s godfather. In a comical moment, Arn berates Val for not being faithful to their oath never to marry, only for Val then to see a baby who turns out to be Arn’s son, and named Val for him—truly the most delightful moment in the book. 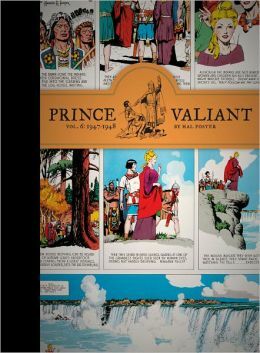 All in all, I have seen many reviewers rave that this is the best volume of Prince Valiant to date. Honestly, I thought the story could have used more plot. Once the characters arrived in North America, it was a bit slow for me. I am turning out to be less of a fan than just curious and interested in the Prince Valiant strip. I will continue to read each volume as it comes out—though Fantagraphics appears to be taking longer and longer between each volume—Volume 7 won’t be published until September. I am perhaps most looking forward to seeing how Valiant’s children turn out, so I will be patient and continue to read on. Unfortunately, the books are very difficult to find in the United States, and many of them at Amazon are being sold for hundreds of dollars. 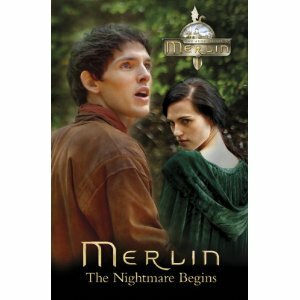 I was able to locate a copy of Merlin: The Nightmare Begins at Amazon for a reasonable price, and I was delighted when it came in the mail to see it was a hardback which I hadn’t expected. Unfortunately, my delight ended there. I am sure many fans of the series will enjoy these books, especially younger readers, but I was very disappointed. I have read movie and book tie-ins before and I know they are usually written as an afterthought and they usually don’t give more information or plot or characterization than the movie or TV show itself, but some of the reviews I read of the books in the series, not Merlin: The Nightmare Begins specifically, did say that some additional information is in the books. I admit that I didn’t re-watch the episode that ties in with this book (“The Nightmare Begins, season 2, episode 3), but nor did I find anything additional in the book that was worth mentioning. I was happy to order this volume specifically because of my interest in the series’ depiction of magic and the Old Religion, and this book details how Morgana has nightmares and leaves Camelot to seek the druids, who make her realize she is not crazy but has magic herself. Unfortunately, the writing in the book was very dull, pedestrian, and did nothing to make the story more interesting or intriguing. In fact, halfway through reading, I took a nap. Then I woke up, thinking maybe I was just too tired to read, but the book didn’t get any better when I returned to it. It took me about three times as long to read this book as it would have to watch the episode. I’d have been better off to watch and enjoy three episodes of Merlin than to read it. Moments in the storyline that were caught in the film that contained humor, charm, action are all lacking in the retelling of this story. Perhaps some of the other books are better. I would go so far as to read another one if I could find it at a reasonable price, but it is unlikely, as I first intended, that I will want to collect the entire series. It’s too bad because I really love the series Merlin. I think it’s the best Arthurian TV series ever made, and it probably surpasses most if not all of the Arthurian movies, despite criticism it has received that it has little to do with the actual Arthurian legend, but its production qualities are very high in my opinion. Sadly, the book series’ production value is not up to the TV series’ standards.